What's better than one sale? Two? Nah, three. Old Navy is combining three separate sales this week, and tossing in an extra bonus as well. 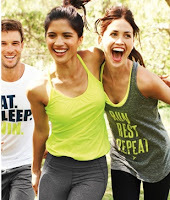 Old Navy Active apparel and men's clothing are up to 40% OFF. They are also discounting summer camp clothing for the kids from $5. Summer camp is basically summer clothing - shorts, tees, shirts, shoes, and other essentials. Here's the bonus: for every $25 you spend through June 16 you'll get $10 in store credit for purchases from June 20-26. So you have a window to get the discount, then a window to spend the credit. Click here to view the deals at Old Navy.